While most people are bystanders and not standing up or acting out towards a better future for our youth, Philadelphia Dentistry and Dr. Ken Cirka changed that. 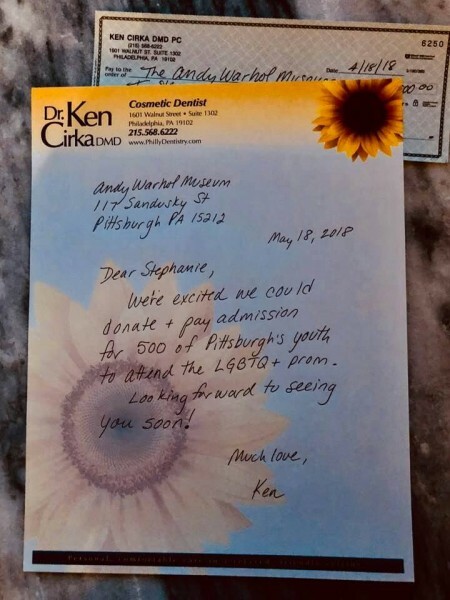 On Sunday, May 27th we will be changing the lives of LGBTQ+ teens by sending 500 teenagers to prom at the Andy Warhol Museum in Pittsburgh, PA. This one small action can change the lives of so many by giving these prom-goers the opportunity to experience a milestone in their teenage life. The fifth annual LGBTQ+ Youth Prom which is one of the only LGBTQ+ Youth Proms in the Southwestern part of Pennsylvania will be helping underprivileged teens from 13-20 years old have the time of their lives. This prom is an opportunity for participants to be able to completely be themselves, which is not always the case at their schools, homes, or even in their communities. An evening, that includes a sit-down dinner, silkscreen printing, dancing, and many other activities planned to give the teens a night they won’t ever forget! The Warhol Museum actively supports the LGBTQ community by having different events at the museum, such as, celebrating National Coming Out Day by having special tours offered every last Saturday of the month at three o’ clock. In 2014, Grace Marston who is one of the LGBTQ Youth Prom advisors created a tour called, the Dandy Andy: Warhol’s Queer History tour. This tour takes you back in time to the legends romantic relationships and queer identity during the gay rights movement in America. This event is generously supported by the American Eagle Outfitters Foundation and Philadelphia Dentistry’s very own, Dr. Ken Cirka to help change the lives of our youth to make a better future for everyone. There are so many ways to give back to the community, especially when you live in the great city of Philadelphia. Philly Dentistry loves to stay connected with the community by giving back and volunteering whenever we can. 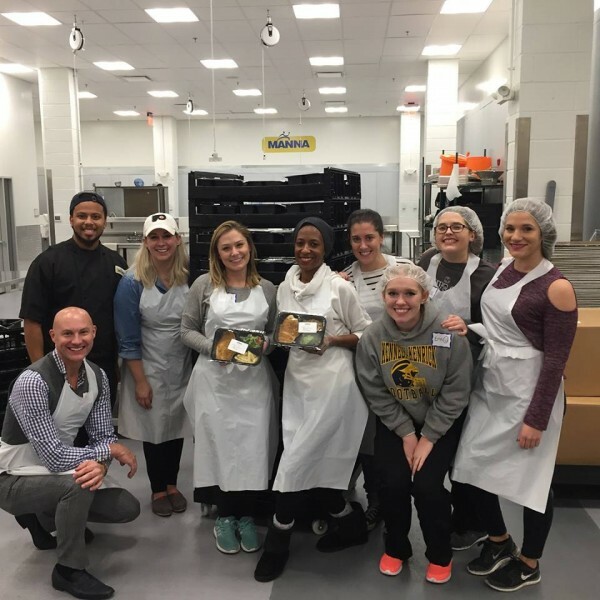 Recently, some of our staff volunteered at the MANNA Organization which helps deliver nourishing, healthy meals to those battling life-threatening illnesses. In 1990, MANNA was founded with a mission to help relief people battling with the terrible disease of AIDS. Often times, people dealing with this awful disease had no where to go because of the stigma that went along with AIDS. When there was nowhere else to go they could always count on the love, care, and nourishing meals that went along with MANNA. In 1997, MANNA wanted to help more people fighting critical illnesses like cancer, diabetes, and cardiac disease so it moved to a 10,000 square foot office with a commercial kitchen. In 2008, MANNA received a $1 million grant from the Commonwealth of Pennsylvania, a $500,000 check from Steven Korman who is a philanthropist and business leader, and other gifts and donations from the community of Philadelphia. Today, MANNA is generating three meals a day, 7 days a week, 52 weeks a year in its state-of-the-art facility located on 20th Street in Philadelphia. They now have a staff of more than 30, along with a full commercial kitchen and a convoy of trucks to deliver nourishing food to people battling serious illnesses in Southeastern Pennsylvania and Southern New Jersey. When you first arrive at MANNA you are welcomed right away with a smile and taken back to watch an introduction video about the history and mission of MANNA. After watching the video, you then go to the kitchen where the MANNA staff explains to your group who is responsible for each specific duty. The duties include, each person placing a different food into their designated space on the plate and then moving it along the line to the next person to place more food, and so on, until it is sealed shut and stacked to be transported to the trucks to be delivered to patients. Our team at Philly Dentistry helped to make over a thousand meals for MANNA. Each year MANNA has over 4,200 volunteers who donate over 40,000 hours to help those in need and get the nourishment they deserve. There are different ways to get involved with MANNA either if it’s with a group or individually. To get all the information you need or to answer any questions you may have you can visit http://www.mannapa.org/volunteeratmanna/ call at 215-496-2662 ext. 100 or email at volunteers@mannapa.org and be part of the “MANNA Miracle” and help those in need. If you haven’t heard of the new way of straightening your teeth rather than traditional braces, then you need to hear about Invisalign. 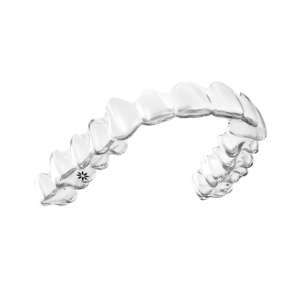 Invisalign aligners are designed to straighten your teeth like conventional orthodontics, without the metal brackets and wires. Philadelphia Dentistry develops the aligners from the X-rays, scans, photographs, and an evaluation of your bite. The number of aligners and the length of time are determined by the treatment plan developed specifically for you. In only several months you can have straight, white teeth! Invisalign is the newest and easiest way to straighten your teeth in the shortest amount of time. Sounds great, right? Now, you’re probably thinking how does this all work and what should I expect? What to expect during your Invisalign appointments? Records Appointment- This record appointment will last about 50 minutes and you will have a detailed scan of your teeth and photographs will be taken. If you do not have a current full mouth x-ray on file we will need to take a new one. Your next appointment will be in approximately 3 weeks. We will wait to schedule this appointment once we know when your case will be delivered back to our office. First Appointment: You will receive the final instructions about the wear and care of your aligners. This appointment will last about 60 minutes and you will then place your first set of aligners and we will teach you how to insert and remove them properly. At this appointment we will also be placing tooth-colored attachments on your teeth and begin to perform any IPR (inter-proximal reduction) this is also known as slimming or slenderizing which will be discussed at your first records/ consultation appointment. Monitoring Visits: These visits will happen every 6-8 weeks and last about 20-30 minutes to receive your next set of aligners. You will need to come with the current aligner set in your mouth. Our doctors at Philadelphia Dentistry will make sure your teeth are tracking and moving as they should in the aligners. Any IPR (slenderizing) needed will be done and new aligners will be placed. The number of monitoring appointments depends on the number of aligner sets that have been prescribed for your specific treatment plan. Treatment Progress- This is the most important step for success of your Invisalign treatment. It is imperative that you wear the aligners as instructed. Invisalign only works when you are wearing them. It is recommended that aligners are worn at a minimum of 22 hours per day, without exception. The only time the aligners should be taken out of your mouth is when you are eating and drinking, brushing and flossing, or cleaning the aligners. You need to wear each aligner for a minimum of two weeks, or as directed by our Philly Dentistry doctors. If you notice that your current aligner is loose and no longer moving your teeth don’t be worried, it may take longer for the roots to catch up with the crown of the tooth. If you miss some days for any reason just pick up where you left off and wear your aligners for a full 14 days minimum along with calling our office to give us an update. Insertion and Removal- Each aligner is stamped with a letter and a number. For example, U for upper and L for lower. These numbers correspond to the number of the aligners in sequence. It is important to make sure you have the proper aligner in the proper number sequence as marked on each aligner. When inserting your aligners gently push over your front teeth. After, apply some pressure to the tops of the left and right molars until they snap into place. DO NOT bite your aligners into place. Make sure each aligner is all the way down and there is not any space between the edge of the tooth and the edge of the aligner. If the aligner is not fully in place your teeth will not move properly and the next aligner will be even further off. This can waste weeks of treatment and could cause you to start your treatment over with possible extra fees. To remove the aligners, first pull off equally on both sides of the back teeth, and then gently lift off of the front teeth. After removing rinse, the aligners with cold water and store in the proper container. To prevent any damage to your aligners, avoid unnecessary removal and do not use sharp objects to remove your aligners. Retainers- Once treatment is complete, we will order your retainers. You will wear your retainers full time, like your Invisalign aligners for 6 weeks. After this time the retainers are then worn at night only. By wearing this every night your teeth will remain straight. Our doctors at Philly Dentistry recommend this, but most patients choose to wear retainers nightly for 9 months. Then after 9 months, 2 nights a week to maintain the position of the teeth. There is a chance without retainer use that your teeth can move out of place again. Eventually, your retainers will wear out, which will result in them losing their ability to function properly, allowing your teeth to shift. You will need to replace your retainers when this occurs. 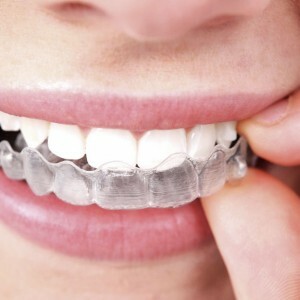 The first set of retainers is included with your Invisalign fee and should last about 1-4 years. We recommend you bring your retainers with you at each cleaning appointment for us to evaluate and clean them at no charge. If you feel your teeth are shifting at all, call us so we can evaluate. New retainers will be made for you when necessary. Give us a call today at 215-568-6222 to schedule your appointment to see if Invisalign is the best option for you and get that beautiful smile you’ve always wanted and deserve.